Anybody born from the 1990s onwards should have fond memories of Horrible Histories in one form or another. The original books by North East writer Terry Deary sold over 25m copies and became a fixture of schools and libraries across the world, whilst the BBC sketch-comedy show won awards and critical acclaim in abundance. 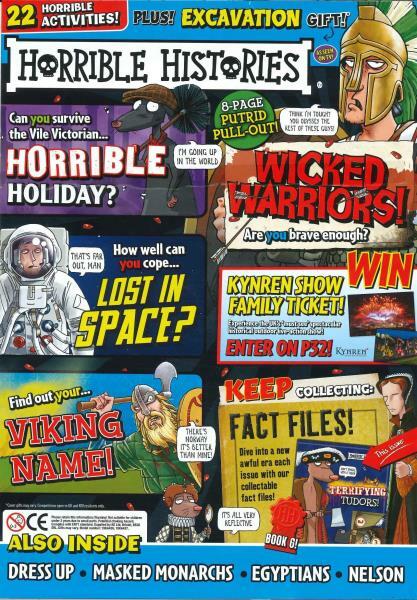 Carrying the same feel of other entries in the franchise, the Horrible Histories Magazine is jammed full of the very best and most gruesome facts about some of history's biggest names, places and times. There are also regular puzzles, games and free gifts to keep the fun going even longer. If your young historian has ever wanted to know about Tudor execution rates, the facts behind mummification or how flatulent our previous monarchs were then they can find all the answers within the pages of Horrible Histories. It has really sparked an interest in history for my grandsons who particularly love all the gruesome bits! They are remarkably knowledgable about things I often know nothing about. Birthday present for grandchild who loves it. My daughter loves this magazine it’s funny and teaches her a great deal about history. Great fun. My 8 year old daughter loved it! A great way to encourage a love of history. my grand-daughter requested a repeat order so she must enjot it. I like the fact that my grandson, a reluctant reader, is making a big effort with this magazine. It's a fun and interesting magazine that the children love in my library in Tokyo. My grandson loves it and can't wait for the next one to arrive. Engages my son and encourages him to read, factual and informative. Excellent, learning in a fun way. My son likes the gift/toy, the sweet and the interesting facts. A real treat at the end of the scool week for my son and us too! brilliant magazine, topics related in a fun way that appeals to my grandchildren, but at the same time full of information, that they retain. Absolutely love this magazine. Very informative, especially for my son. Just a fab alternative to football for a football mad boy! My Grandaughter absolutely loves this magazine, it really helps them to understand history in a fun way. I ordered these as a 6 months subscription for my grandson who has enjoyed them so far, and has now asked for more. I bought this for my grandson who is enjoying it very much.